Jamie and many friends planned a weekend trip from Atlanta to New Orleans to celebrate Mardi Gras. 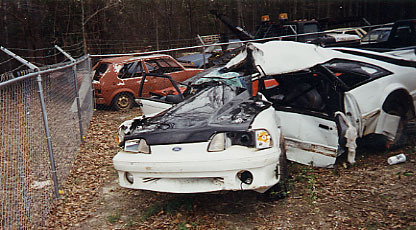 On Sunday, February 9th 1997, at 12:15 PM CT the accident occured on the drive back. Willie was the driver, Jamie was in the front passenger seat, and Sarah and Terry were in the back. Willie fell asleep at the wheel and drove into the median. He woke up, overcorrected the vehicle and crossed the highway and slammed into a tree on the drivers' side. Jamie was also asleep at the time and was thrown into hatchback area and landed on Sarah. The coroner's report states cause of death was a broken neck at C1. This is the Ford Mustang she was killed in on Interstate 65 in Alabama on her way home from Mardi Gras. The accident site can be visited today by traveling on I-65N just past mile marker 121 between the Georgiana and Greenville exits. Mom (Judy Quillen) visits each year on February 9th to plant flowers and preserve the memorial to Jamie.